You may be the only trustee or you may be a co-trustee. You may name another individual(s), or certain financial institution, as your trustee. You should also provide for a successor trustee to act in the future in the event of your disability or after your death. Anyone you select as a co-trustee or successor trustee should be capable and trustworthy. Family members may or may not be selected by you depending upon your circumstances and their abilities. You should also consider whether a bank can provide services that an individual cannot. A proper estate plan utilizing a living trust makes it possible to avoid probate. Probate is the process where upon your death, a will is filed with the court, along with other legal documents, and the estate is administered under court supervision and open to public record. Much of the current interest comes from concern and publicity about the cost and length of time to complete the probate of a will. In Iowa, probate fees and court costs are based upon the size of the estate. A typical probate administration may run anywhere from six months to a year, or even longer in certain cases. The fees for handling a trust are negotiable between the trustee and the attorney. You should consult with your lawyer about the comparative costs of various estate plans. You can have another person or bank which has investment expertise act as a trustee and make investments for you. You can avoid the expense and inconvenience of having a conservator manage your property if you become too sick or disabled, but only if all of your property is in the trust. After your death, the trustee can distribute the trust assets directly to the beneficiaries without going through the probate process. This is particularly beneficial if you own real estate in more than one state. After your death, the costs and expenses for personal representatives, lawyers, court costs and others may be less. It is possible that a living trust can be kept more confidential than a will. Contact a Iowa Trust & Wills lawyer representing clients in Ames, Iowa today to schedule your initial consultation. Upon your disability or death, the management of your trust assets will depend upon the honesty and management ability of your successor trustee who may act without court control or involvement. You may have to pay trustee's fees and expenses if you use a third party as trustee, including the costs of filing an annual trust income tax return. For federal income tax purposes, as long as you act as the trustee or the co-trustee and the trust uses your social security number for its taxpayer identification number, your living trust will be treated no differently than if you had not created the trust. Likewise, you will not save any "death" taxes (state inheritance or federal estate) simply because you have created a living trust. Although, a properly prepared living trust can reduce death taxes; exactly the same savings can also be achieved by a will. Any property which you do not transfer to the trust will be subject to distribution as set out in your will or the Iowa laws providing for distribution of your estate if you do not have a will. If any property is not transferred, then you may be required to have the entire estate handled in the probate process. You should also have a will to cover any assets that are not transferred to the trust. This is termed a "pourover will" which transfers any property which you own at the time of your death to your living trust or a will which has other provisions. Can My Successor Trustee Immediately Distribute Property From the Trust After My Death? Generally, no. Your trustee must first pay your debts and expenses, resolve any trust problems, file tax returns (income, state inheritance tax and federal estate tax) that are due and owing. You can use a form or kit or even prepare the trust agreement yourself, but your situation may not fit the form, or the form may have been poorly prepared and may lead to adverse tax consequences and conflicts over property distributions. Problems with the forms or kits may not surface until years later, sometimes not until after your death when you cannot change the trust and clear up the problem. Just as you would run the risk of flying in a plane built by someone without the proper training and experience, it can be "dangerous" using a trust form or kit without using a knowledgeable attorney. Warning: Certain publicity and persons selling living trust kits have been misleading people into thinking that the property in a living trust is protected from taxes and creditors. This is not true! A living trust will not protect your property from nursing home expenses, hospital bills, or other creditors, nor will the creation of a living trust qualify you for Medicaid. You have taken a lifetime to accumulate your wealth. You should take great care to make certain that your estate plan carries out your wishes without problems. A living trust may or may not be right for you. Competent professional help is essential to make certain that your estate plan meets your specific needs. If you would like to schedule a initial consultation contact an Iowa probate attorney, representing clients in Ames, Iowa at Howes & Anderson P.C. Give us a call at (515) 225-9000 or complete our inquiry form. How can I revise my will? What is the federal estate tax (or death tax)? 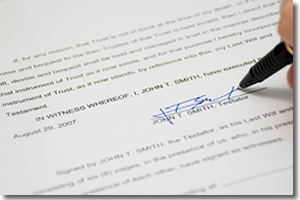 Do I need an estate attorney when I can write a simple will myself?